That’s double what had been reported. FIGURES REPORTED LAST week that painted a picture of a system that was lenient on drink-driving are wrong, the Courts Service says. A statement from the service says that figures reported last week that claimed just 40% of cases led to convictions were inaccurate. They say that the figures, provided to road safety campaign Parc through a parliamentary question to independent TD Tommy Broughan were based on the wrong figures. 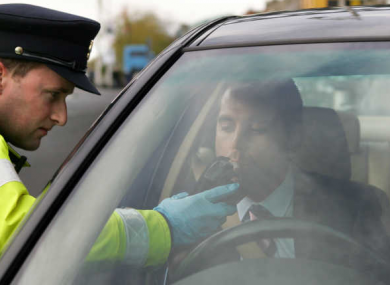 “Recent reporting, and commentary on drink driving cases and conviction rates, has been inaccurate: simply due to the extrapolation of conviction rates from the wrong set of figures. “This has distorted the actual outcomes in cases heard, and in no way reflects the conviction rates in the District Courts. Conviction rates are actually over twice the 40% reported and commented upon recently. In figures compiled over the past week by the Courts Service – it is clear that the average figure for convictions each year is between 85% and 88%. A number of outlets last week carried the figures, with some saying that the government was planning a crackdown on drink driving. Today, the Courts Service has released the full figures, saying that the error came about from comparing convictions to summonses requested, printed and issued, but ignoring the number of outstanding summonses at year end. It is therefore inaccurate to extrapolate conviction rates from such figures – as the courts have not heard many of them. . So far this year 66 prison sentences have been imposed for Drink Driving, 85 suspended sentences, 1,776 fines imposed, 20 community service orders made, and 1,907 disqualifications ordered. In Bray, the conviction rate is 80%, but in Cork it is 93%. Read: Poll: Would you ever get in a car with a driver who’d had a drink? Email “The courts say they have an 86% conviction rate for drink-driving”. Feedback on “The courts say they have an 86% conviction rate for drink-driving”.